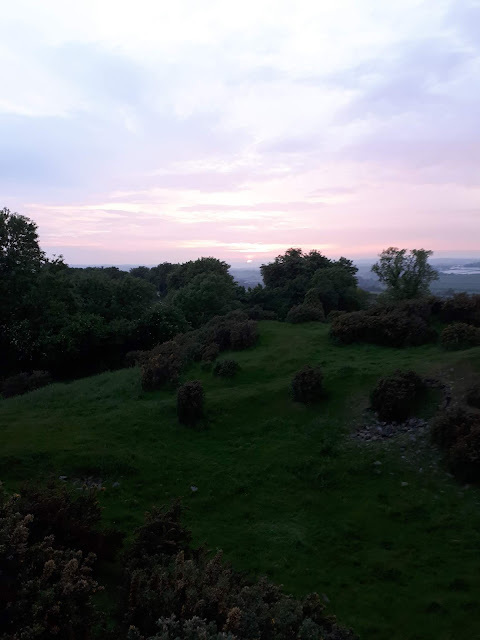 Back in June this year we visited a friend in Ireland and since he lives way up in Co. Donegal we broke the journey by staying a couple of nights in the Boyne Valley, home to some of the most impressive Neolithic monuments anywhere in the world. 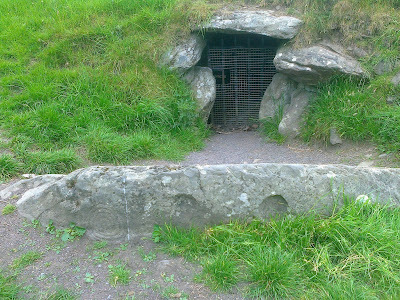 Brug na Boinne, also known as Newgrange, and its companion mounds of Knowth and Dowth are stupendous megalithic passage graves dating to around 3,300 BC and hundreds of years older than the earliest Egyptian pyramid. We struck lucky in the B&B which we’d found in anxious flurry at the last minute after discovering the one we thought we’d chosen had double-booked. For it turned out to be a beautiful old house with lovely views next door to the great mound of Dowth: and I mean right next door – the mound towered up over the garden fence; we could go out before breakfast or last thing in the evening with Polly and walk around it and over it and have it completely to ourselves. 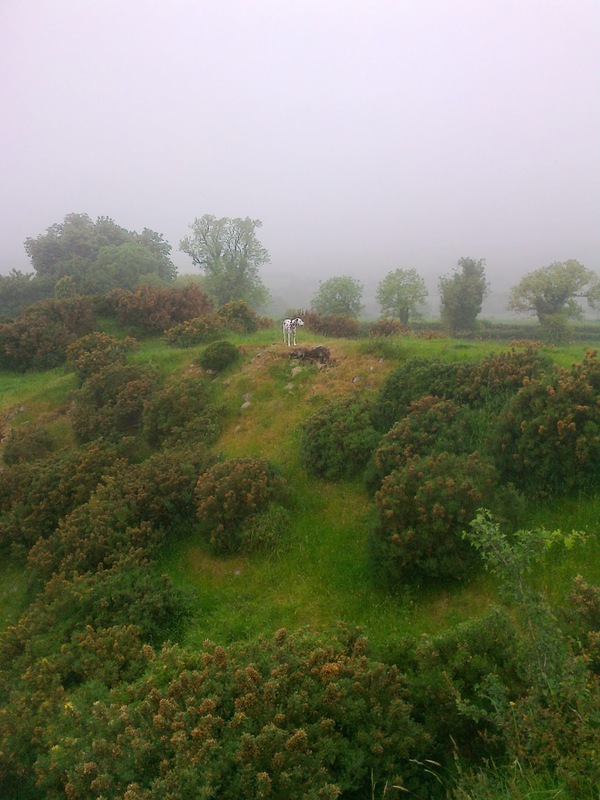 Dowth, or Dubad, is not a tourist site like its companion tombs, Knowth and Newgrange. No shuttle buses visit it. There’s a huge crater in the centre, the result of the local landlord blasting a hole in it with dynamite sometime in the 19th century. If he hoped to find treasure, he was disappointed. 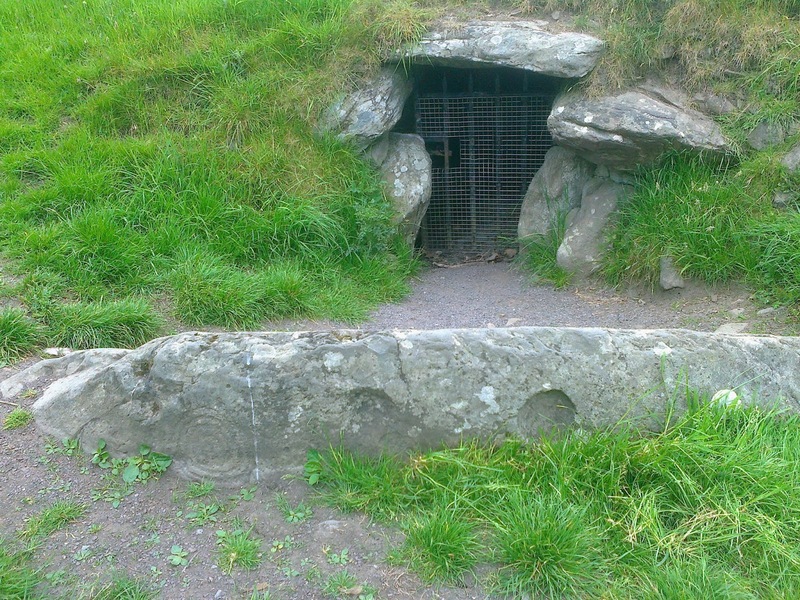 But the mound was so massive and so well built that even the explosion did not damage either of the two passage graves deep within. Here's one of the two entrances, with Polly nosing around to give it scale: in the foreground is one of the huge carved sill-stones which rim the perimeter of the mound. This one is carved in spirals. You can't go in; there's a locked iron gate. 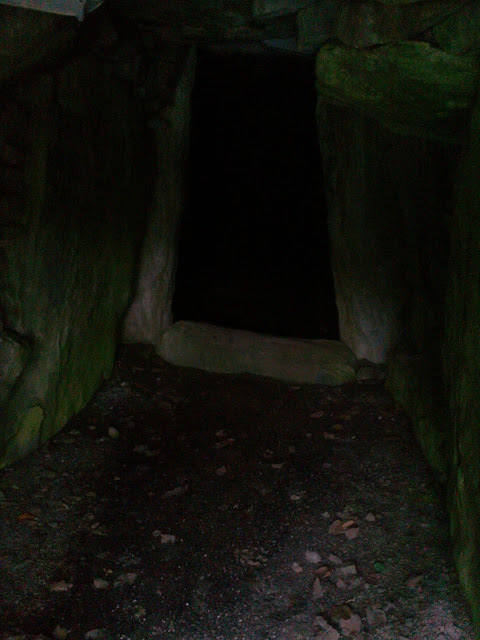 I tried to take a picture through it, and maybe you can just make out the passage running back into the mound towards the inner chamber. Thank you for this. Apart from enjoying the blog and the legend, it reminded me that I want to go and see Ireland's great passage graves. 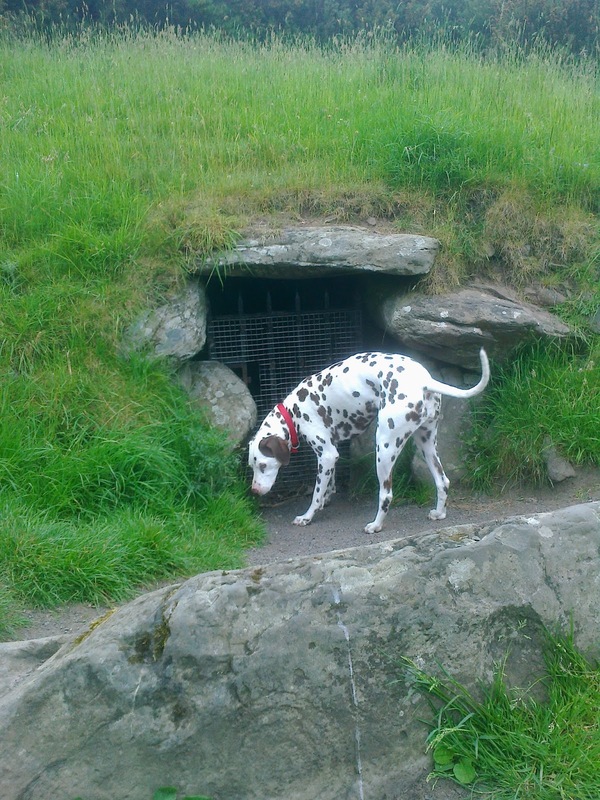 I've seen and wondered at Maeshowe: really should go and see Newgrange -- and Dowth! You so should, Sue! They are wonderful. More to come in future posts! Wow! This is wonderful. I would love to go there. I’m definitely building up reasons to visit Ireland! I might add this to my next visit home. Thank you for this, Katherine. Dowth. Thanks, Katherine - I'll tell him. And will research the environment around the mound since I now have arthritis in my knees. I can go up slopes easily enough, but can't get down! Thanks for posting this, Katherine. It brings back memories. My father took us there when I was a child. That was a long time ago. Access was down a ladder into darkness. We explored by candlelight. I still feel the wonder of it. I remember you talking about this when we walked together at Charney, Kath -- great to see the post.